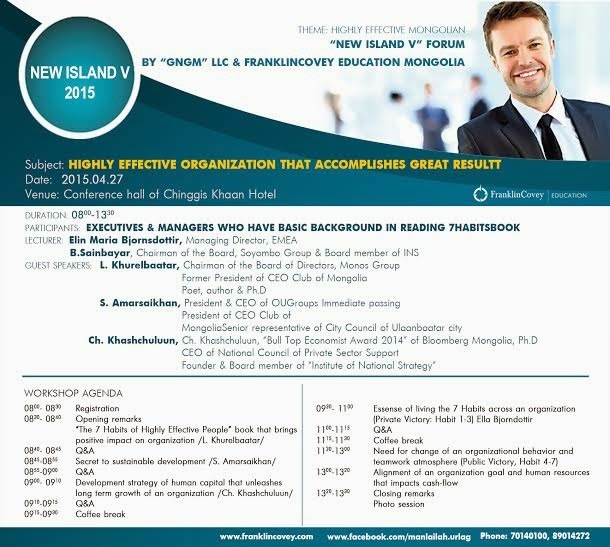 You are invited to participate in "New Island V" workshop, FranklinCovey Education Mongolia. FranklinCovey Education opened in Mongolia officially in January, 2015. First workshop on the topic “Highly Effective Mongolian” New Island V will be held at Chinggis hotel between 25-27 April, 2015. Register at 70140100 or 89014272, download agenda here. The workshop will be led by Ella Bjornsdottir, Managing Director for FranklinCovey Education EMEA and Global Senior Executive Consultant at FranklinCovey Education. Ella is a leading expert in transforming school and organisation culture, with years of experience lecturing and teaching leadership and management on every level in the social community. She has helped thousands of individuals around the world reaching their full potential through her work with FranklinCovey’s The Leader in Me and the 7 Habits of Highly Effective People. · Cameron McRae, Board Member of "Institute for National Strategy of Mongolia"